The Tamboli are a people of India traditionally associated with the production and distribution of the betel leaf and areca nut. Millions of people of South Asia and the Pacific chew areca or betel nut as a mild stimulant as many Westerners drink coffee or tea. In fact, the name Tamboli comes from a Sanskrit word meaning "betel leaf." Most Tamboli speak Hindi and another regional language. The Hindu Tamboli live across central and northern India. Most Tamboli live in the Indian states of Maharashtra, West Bengal, Bihar, Uttar Pradesh and Madhya Pradesh. Entire Tamboli families work in the betel nut industry. Children often quit school at the age of nine or ten to help their family business. Women and girls frequently have only minimal level of education. The betel vine must have moist, fertilized soil or the plant will not flourish. Chewing betel leaves is a common practice in social occasions in South Asia. Other Tamboli work as farm laborers, in government or commerce. The Tamboli are usually monogamous, which means married to one person. They marry within their community. Only males can inherit property. A council of elder men rules and dispenses justice within a Tamboli village. The Tamboli eat fish, chicken, mutton but refrain from beef and pork. Most of their diet consists of grains, vegetables and fruit. 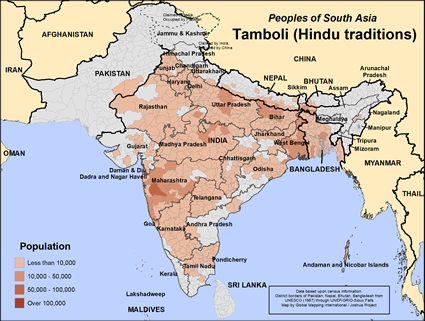 The Tamboli are Hindu. They worship gods and goddesses like Krishna, Shiva, Rama, Ganesh, Lakshmi and Hanuman. They observe the main Hindu holidays of Holi and Diwali. Some Tamboli cremate their dead while others bury the dead. They will probably seek the help of a shaman for their health problems before visiting a modern medical professional. Long term chewing of betel nut and leaf is destructive to one's health. The side effects of chronic chewing betel include cancers of the mouth and esophagus, kidney, liver and heart disease and psychiatric disorders. The Tamboli need other business opportunities that do not damage human health. * Pray that Indian Christians would reach out and befriend the Tamboli. * Pray that God would lead Christians to help them in their business, health and educational needs. * Pray the Tamboli would develop a hunger for the gospel and Word of God. * Pray that the Lord would lead the Tamboli to obtain and read the Hindi Bibles that are currently available.View Tamboli (Hindu traditions) in all countries.